The Twenty Eleven WordPress theme is currently one of the most popular themes being used in the community and has been downloaded over 17,000 times. However, it does seem to be lacking in the number of options available for easy theme customization. For example, the absence of sidebars on single posts and pages can put you in a pickle if you don’t know how to add a sidebar. Or perhaps it might be confusing for you to figure out how to change the height of the header image with no default options. That’s why I’d like to introduce you to Twenty Eleven Theme Extensions, a plugin that puts a few options back into the hands of the average WordPress user. Whereas the default Twenty Eleven theme has only a couple of design options in its panel, the extensions plugin will add many more. Adds the widget sidebar to all pages, and single-post pages. Optionally centers the navigation links at the top of single-post pages with a sidebar. Changes the default height of the banner image in the header. Adjusts the alignment of sidebar widget titles. Automatically turns sticky posts into single-line headlines to alert your readers of something important. Adds custom CSS styles for your site safely in a place that won’t be overwritten when you update WordPress or Twenty Eleven. One of the main advantages beyond the ease of customization is the assurance that your custom styles will be safe every time you upgrade your site. If you’re using the Twenty Eleven theme but don’t want to hassle with creating a child theme, then you’re going to want to have this plugin installed. 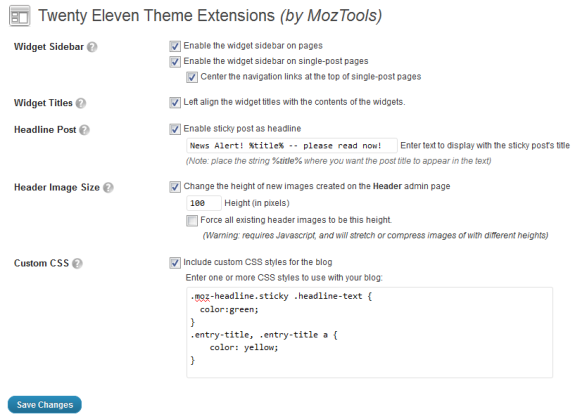 The Twenty Eleven Theme Extensions plugin will help you make Twenty Eleven your friend. Download it for free from the WordPress plugin repository.